Kitchen islands are the most frequently-requested features, according to statistics. 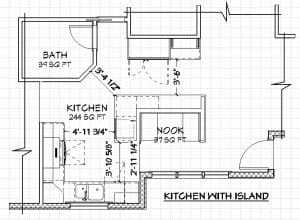 The available space determines whether or not an island is appropriate. But there’s more than just space. Islands do affect the function of a kitchen, and should be carefully planned according to the individual family’s work-flow habits. A standard kitchen sink or a cooking surface should not be placed in such a narrow island, for safety reasons. The narrow island is a good place for a smaller sink, a built-in microwave below the countertop, additional storage and food preparation countertop. An island can be a major obstruction in the middle of your kitchen if it isn’t planned well. It’s not a good idea to have the island between your refrigerator and sink, because it interrupts the “working triangle”. You shouldn’t have to walk around the kitchen island to retrieve anything important. There are times, though, as the example shows, there wasn’t enough space for the refrigerator to be closer to the sink, without crowding the range and hood. Many people thinking about remodeling their kitchen have a mental picture of family and guests sitting at the back side of an island while food is being prepared. They may also envision quick morning or weekend meals being enjoyed while seated at the island bar. This arrangement may be great for individuals or children, but not for couples. The problem with bar seating: It kills the potential for conversation! Most of us enjoying a conversation while we eat like to face the person we’re talking with. An attached peninsula may be a more functional alternative to a kitchen island. A family discussed the results and additional investment of almost $35,000 required to add onto their home so they could have an island. 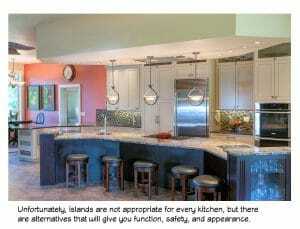 They chose to abandon the idea of an island and opted for a peninsula in their remodeled kitchen. 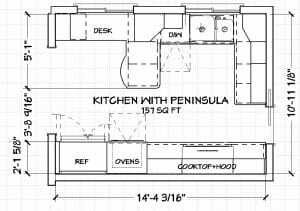 They had good working countertop space, and more room for multiple people to be working in the kitchen simultaneously. They had the option of installing a “prep” sink and second dishwasher where they chose to put the family desk. Together, the family made hundreds of informed decisions. Peninsulas are great for all kitchens, large or small! Kitchen islands (and peninsulas) can be configured in a multitude of shapes, to fit a family’s lifestyle. A trained professional kitchen designer can help you discover what’s exactly right for your needs — and your budget. If you have just begun your search for a professional designer, please take a few minutes to look through my website, especially the page about my design process. It’s filled with helpful information! Read about award-winning author and designer Diane Plesset, her career, philosophy, experience, and training.